Tuning Forks enhance the ability to heal and make profound changes in the energy levels of the body using sound. Tuning Forks are used to correct imbalances, uncover emotions, stimulate growth, development, and transformation and facilitate inner harmony and wholeness. The Tuning Forks are applied to the acupuncture and acupressure points to access the Body's Meridian and Chakra energy systems. The sound waves of the Forks vibrate and travel deeply into the body along energy pathways, effecting human physiology and reaching places not easily accessed by traditional medicine. Applying the Forks stimulates and balances the body's physical and subtle energy field to promote healing and inner harmony. This cosmic tone helps us to shift from fragmented stagnation to an open world and infinite possibilities. It is this recognition, acceptance and participation in our destiny that opens us to a bigger picture. We enter the world of creative origination, healing, unity and balance. This healing methodology has the power to connect us with the Source of original harmony. It provides access to a deep inner balance by sonically resetting negative cellular patterns. The work is powerful and profound, it has the capacity to relieve chronic and debilitating illnesses and imbalances of the psyche and soul. Through the Healing system we are able to realign and re-harmonize ourselves with the greater cycles of the universe. The Tuning forks are designed to be used on and above the body. 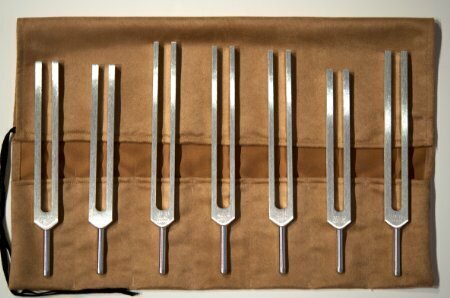 When tapping the tuning forks, they produce a pure musical sound called a interval. As the body listens to the tones it will naturally adjust itself and come into balance. The actual effect of Tuning Fork Sound Therapy can be verified by a number of methods which include Kinesiology muscle testing procedures to check the status of the organ meridian energy circuits and the Chakras which are directly over the main nerve plexus points in the physical body. The “energetic” patterns of sound, color, light, toning, and music have the capability to “Tune -up” and balance the energy system, making it more efficient. Pain can be eased, stress reduced and depression lifted. The Body- personalities become more vibrant and energized. The Mind-becomes clearer, creativity is increased, resulting in a wider perspective and an improved ability to make major decisions. The Emotions become more stable. The Spirit- is more peaceful, greater joy and improved well- being are found in the process. Tuning Forks Balance and Energize the Chakras. A person can experience any and all of these in a healing session. * Feeling the connective with Spirit and God.